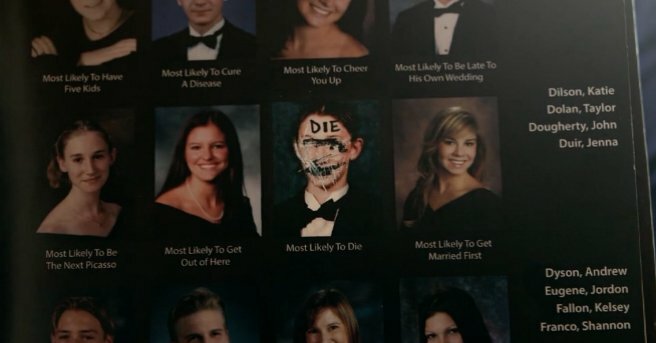 Most Likely To Die evokes all the regrettable moments of high school slashers, and none of the fun. It all starts when a group of high school buddies get together for a reunion, sharing the same swanky house. There’s Brad (Ryan Doom), a hotshot television actor, Gaby (Heather Morris), a professional poker player, Freddie (Perez Hilton), a recovering alcoholic – you get the picture. Many different people with lives they’ve left behind, ready to be tested when a ghost from their past starts spilling blood. When the classmates begin turning up cold, one by one, they fear a “harmless” prank from their youth may have doomed them all – a sentence that’s more than deserved when the actual truth is revealed. I understand a want to run some type of tonal theme throughout Most Likely To Die, but poker? Sure, a comment here or there about life relating to a gauntlet fought on felt is fine, but Gaby’s dialogue is more laughable than poetic. Entire dramatic moments requite a translation from Phil Hellmuth, as ex-lovers fight in gambling code – none of which is aided by lackluster acting. In one particular scene, Perez Hilton (yes, THAT Hilton) glimpses a dead body, screams and runs out the door in some fit of unwatchable lunacy. Then there’s Jake Busey (yes, THAT Busey), who creepily lurks for a single scene, only to be killed off as a pointless red herring. When weak writing and stiff acting collide, the result is typically ugly. That said, there’s one pretty righteous death where a graduation cap is flung à la the Hard Ticket To Hawaii frisbee scene, which confirms that Anthony DiBlasi has vision – it’s just hampered by restraint. This isn’t a big-budget effort, nor is it treated as such. Production value appears to use a crew member’s vacation house, and effects are rarely mystifying. Easily, one by one, characters are offed by utilizing the trickery of camera angles, like a schoolchild pretending to eat a pencil by putting it past his/her mouth. Tack on a sequel-ready ending that makes almost no sense given the scenario, and you have an urban legend which is more blunder than brag-worthy. Most Likely To Die is the kind of slasher that gets a hot actress naked in the first minute or two, establishing a scintillating bit of sleaze, but only because there’s little else to offer. You’re tempted – rightfully so – by Skyler Vallo’s welcome homecoming, but then led astray once a cast of unlikable stereotypes gets drunk and horny, ready to disappoint just like back in high school. There’s certainly room for more good slashers in the horror landscape, but Anthony DiBlasi just can’t bluff his way through this one. What? If this movie is allowed to make five poker puns per scene, I’m allowed one to finish my review!